View Violations on the plugin site for more information. This plug-in generates reports static code violation detectors such as checkstyle, pmd, cpd, findbugs, codenarc, fxcop, stylecop and simian. 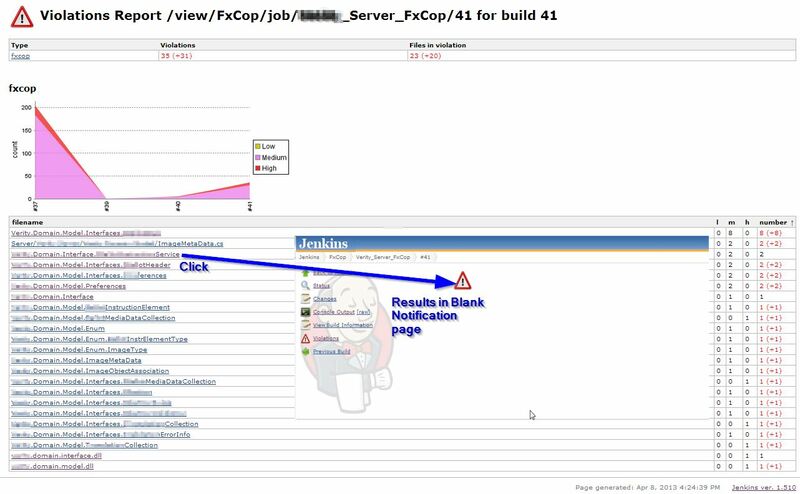 Note: Since version 0.6.0 the violations plugin works with the jenkins maven2 project type.. There are some issues with the maven plugin of findbugs - one needs to set the sourcepath field and it also appears that some violations are reported against incorrect files. Note: the following snapshots are from version 0.4, version 0.7 is similar (with pylint, fxcop, stylecop, simian and gendarme added). Configuration should be easy, First you need to have activate the static code analysizers in your build. Then activate the Violations plugin as shown below. This is used to limit the number of violations displayed per file per violation type. This is the lowest number of violations of this type to generate the sunny weather report. For example the value 10 means that violations 0 to 10 will cause a sunny report, 11 and higher will be cloudy or worse. The is the lowest number of violations of this type to generate the stormy weather report. This is an ant type pattern to match violation files of this type in the workspace. Multiple patterns may be separated by commas. This is an optional field. It is used to resolve classnames to source file names. It is only currently used by the findbugs violations type. This is an optional field. It is used if you just want to run jenkins as a reporting engine for a project not in jenkins workspace. For example, the violations plugin has a jenkins job that cd's to the cvs directory, creates the checkstyle, pmd and cpd reports and the invokes violations plugin with the faux project path set to (PATH TO CVS DIR)/plugins/violations. After configuration, the Violations plugin will collect violations from the next build. The following pages are created or modified. Clicking on the violations link brings one to the current violations report. The build page also has the violations trend and the violations icon. Clinking on the violations link brings one to the violations report for this particular build. Note the following snapshots are from 0.4, 0.7 is similar, except that the +/- notation has been removed. The order of the table can be changed by clinking on the column header. Linking on the file link brings on to the file report. This will show all the violations (up to a limit specified in the config page) of a file, Each violation has a line number, an icon representing the severity and a description of the violation. Hovering over the icon will give more detail on the violation - and for findbugs, this will be the long detailed message. After the list of violations, snipets from the source file will be shown for each violation. This will only happen if the violations plugin can find the file in question. of a certain type exceed a threshold. Bugfix: Fix so pylint errors are marked as errors. Enhancement: add +- changes on the report and build pages. Enhancement: make the file list table sortable. Enhancement:: allow user to optionally specify a different project path for resolving file names. "Configuration should be easy"... um, ok. Then where is this configuration page available from? None of the configuration pages that I can find have a'Report Violations' check box like the one shown above. Am I missing something? How do I get to this page? Yes, I am having the same problem. Can anyone point out where this page is? I found it. To open up the display like the one shown above, look for a checkbox "Report Violations" on the "configure" page for the project to be analyzed. It will pop open the section shown above. I have installed last version of Hudson and last version it of violations plufins, but no chekbox appears. What is the Problem? The violations plugin currently only works for free-style projects and not for maven 2 hudson projects. I am having the same problem. the plugin is started, i can't found de configuration page. I've been having the same problem, graph shows up as a broken image. Started with latest version of violations (.4) and hudson 1.32. PLEASE!!!!!! post any solution for this Issue!!! Please use the issue tracker for filing issues, so that it gets proper attention. Maybe this plugin doesn't work with your project type (e.g. native m2)? What directory is the "XML filename pattern" relative to? i.e. I have an ant based build that outputs my PMD report to a file called build/reports/pmd/pmd_report.xml. I've tried specifying an XML filename pattern value as "build/reports/pmd/pmd_report.xml" but the Hudson build output shows "pmd no report". Hi, I'm also having problems with this. I have an ant based build that output a checkstyle report, but when i put the path to the report file in the "XML filename pattern" field hudson can't find it. Any help would be much appreciated. Firstly thx for the great plugin. Secondly I hit a small snag. When using the plugin with checkstyle, cpd and pmd, I notice a good integration between the cpd and checkstyle report. Ie. when clicking an entry I get an overview of the cpd and checkstyle violations, linked to the appropriate code snippets. Form pmd however this integration is not available. The PMD from the the maven pmd plugin does not contain complete information on the location of source files. If this is your case, you need to set the base directory of source files in the violation plugin. If the class files do not have debug information (for example if they are compiled with ant's <javac> without setting the debug attribute), the pmd code is not in a position to know the source files and the line number of the violation, so the violations plugin using the class name instead. Do I have to install PMD to use it? I recommend you file an issue in the issue tracker. Most likely you have an incorrect file specification, and non pmd xml files have been included in the fileset given to the violations plugin. Hi everyone, i would like to know if it possible to customize the Checkstyle validation properties. Just like in eclipse IDE, because i have a custom checkstyle configuration file and i wanna use him. How come you expect a checkstyle tag in a checkstyle.xml file? You need to specific the checkstyle *result* file and not the checkstyle config file. So for example if the result file is build/checkstyle/raw.xml, use **/build/**/raw.xml. How can I integrate CPD with this? I'm using the last CPD version which is the one point by the http://pmd.sourceforge.net/cpd.html (corresponding a PMD 4.2.1) but it's generating a simple text file, not a XML file that the violations plugin can understand. Do I have to use another CPD version? If I have to, how can I do it? PMD and CPD share the same library (pmd-4.2.1.jar). Is there a way to customize the mapping between the violation type's severity and the violation plugin's severities? I'm asking because for checkstyle, the checkstyle severity "error" (the highest severity level in checkstyle) is mapped to "medium high" in the violation plugin. As a result, in the case of checkstyle the violation report is misleading because it shows only medium and low violations, although checkstyle errors may be present. So I think "error" should be really mapped to "high" in order to be represented accordingly in the violations report. Could this plugin be extened to read file output from SourceMonitor (http://www.campwoodsw.com/sourcemonitor.html)? Im quite seasoned in Python an pylint but very unfamilar with the java way of doing things. It seems that to use hudson with pylint I need one or many "violation xml files". Do I understand correct that the "violation xml files" should be the output of the checker tools? I have problems to understand how things have to fit together to get the pylint output into hudson. and entering "**/pylint.out" into the "XML filename pattern" fieled in the Violations configuration has the desired effect. also need some help with some path issues. So what do I have to write into the config of the plugin to get the Violations to pick up the sources, and link them in the file details page? Does anyone know if it is possible to have multiple instances of the same violation plugin? E.g. run fxcop twice with different rulesets and show the results as two lines in the graph? I've seen some posts that use such patterns. after several builds of the Violations plugin using fxCop to analyze my assemblies the trend graph does not display any results. The build report indicates the violations that occurred but indeed the graph is empty. Any idea why this might be happening ? Sorry, I do not speak English, my main language is Chinese, but can understand simple English the. the thing is that I don't know what is the correct format expected by Violation. Do you have any info on this? check your XML filename pattern ? check output formatter of jslint is xml ? We have a very large codebase with a lot of errors, even with a limited set of rules. We'd like to play the CI game, but Violations has to make a ton of HTML pages on each build, causing a 15-minute delay on a 25-second checkstyle run. Is there any way to turn off the HTML generation for each individual error? We don't really need the list of filenames with their number of failures, and we really don't need a detailed view of the failures for each class. Ideal would be only the files whose failures changed during a build, but no list at all would also be great. I can run the actual cpplint.py like my example above but I don't get any .xml output files. Just a log off the issues in the console. I have this configured to display my fxcop output and the trend chart works well, but when i click one of the files with violations it takes me to blank webpage. I am facing the same problem, for me the o/p file is getting created in at the intermediate path in the workspace, in a build folder parallel to source. As you mentioned it shows me the complete path except the c: , but if i click on it it doesn't show anything, its blank. I had also a problem with StyleCop. In the overview the files with StyleCop-Errors were shown correctly. But when i clicked on the link to see the details-page, i only got a blank page with the exclemation-mark-pic. It seems to be a problem with reading the violation-plugin-generated xml-file, where the SyleCop-Violations are stored in. * Parser for Stylecop XML files. * The descriptor class for StyleCop (MS Source Analysis) violations type. * Create a parser for the Simian violation type. * @return a new Simian parser. Same is happening to me, but can't find those files. I just have the compiled files (*.class). Do you have them, or did you create and compile them? Therefore i replaced the old violations.hpi file in the "plugins"-folder and deleted the "plugins/violations" folder. Then restart Jenkins, and the new plugin will be installed. However, I tried what Kat Lim Ruiz says and it worked, so I will stay on this solution. I cannot compile the violations plugin successfully by maven 2.0.11. I installed the violations plugin and would like to generate cpplint output, however I simply do not know what to do to get it working. I have a simple checkout jenkins projekt. And I downloaded the cpplint.py. However, it doe not produce xml output AFAIR. Could you please point me to some direction, where to look further. - for me the file path is a complete file path I called cpplint.py, e.g. "C:\Users\user\.jenkins\jobs\project\builds\2012-10-11_11-02-55\violations\file\project\src\core\mission\main.cpp.xml"
- this works for relative paths, but throws an exception for full quallified paths, e.g., "C:\Users\user\.jenkins\jobs\project\builds\2012-10-11_11-02-55\violations\file\C:\Users\user\.jenkins\workspace\project\src\core\mission\main.cpp.xml"
But the result always shown in the console in Jenkin and could not be written into CppLintResult.txt. I tried to read the result txt using violations plugin in Jenkins. It could read. Conversely, if I click on a C-Sharp file (ends with ".cs") I do get the code and can hover over the violations and get a description properly. Is there some sort of FxCop configuration I'm missing? How can I get the Violations plugin to display the code violations for these files? any chance you can accept this pull request? It's a fix for JENKINS-14970 which I just ran into today. Is there somone who is still maintaining this plugin?